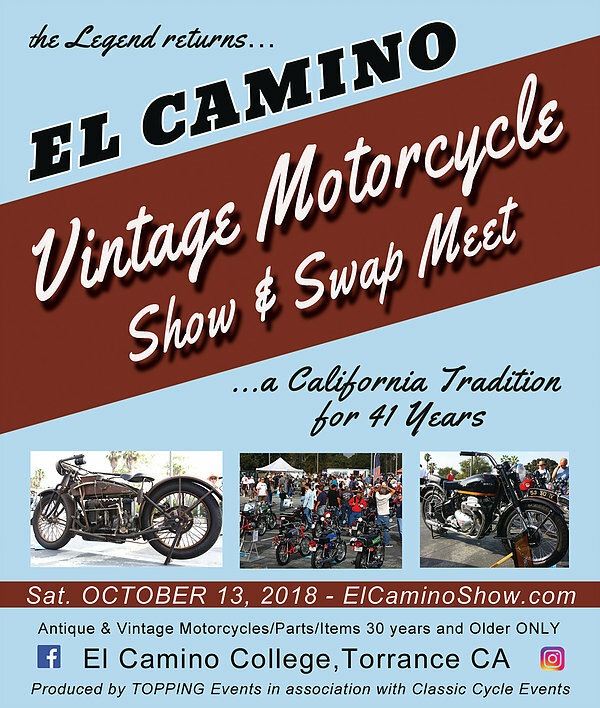 Now owned by Topping Events, the El Camino Vintage Motorcycle Show & Swapmeet Event returns to El Camino College in Torrance, CA., October 13, 2018. Topping considers this to be an antique/vintage motorcycle event, so bikes and parts 30 years and older, only. For vendor information, or for more details regarding the event, please contact Topping Events at 1-800-762-9785. Or go to www.elcaminoshow.com and register to receive updated e-mail notifications. One of the finest Flathead authorities in the country, and trusted business people, specializing in pre-1950 Harley Davidson parts. Rebuilders of engines, transmissions, linkert carburetors, star hub wheels, springers, clutch, and brake assemblies. An excellent source for hard-to-find parts. By appointment, only. Mike at Pacific Coast Cycles is a Southern California treasure. He knows his business, and he knows his bikes. If you're looking for an OEM or Custom build, Mike does it all, from Flatheads to Twin Cams. For international buyers, Mike also sells and ships over seas, routinely, and he has a broad selection of bikes from vintage to late model.